Mozart’s Trio in B-flat, K. 502 is generally listed as No. 3 out of his six, dating from 1786. In contrast to Haydn, whose numbered piano trios go to 45, Mozart was parsimonious in this form, but at least five of his six are mature works, and never fail to delight. 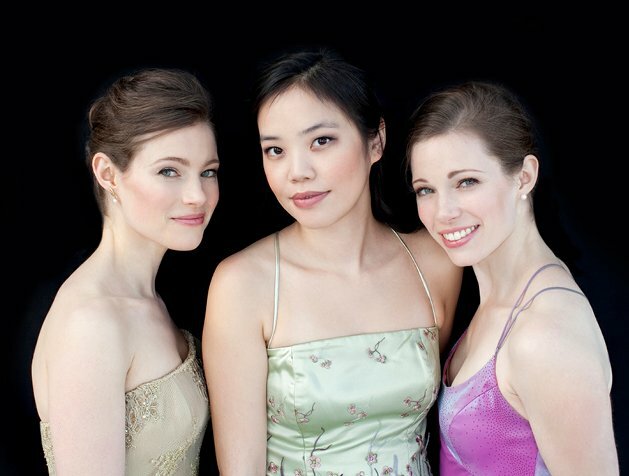 They are all styled as trios for piano, violin and cello, in that order, and this one is full of virtuoso turns for the piano, with the violin chiming in with lovely turns from time to time, and the cello, though its part is technically more independent than early works in this genre, is still mostly relegated to a supportive role. Lam got off to a sprightly and stylish start in the first movement, but while her playing was crisp and elegant, the balance between the instruments was less than ideal, with the strings covered too often, even in the very live acoustic of Peabody Hall (and live it is, even with almost all the seats filled). Granted that the pianist is almost never in control of what instrument (s)he plays, a little more advance time in the room with an auditor might have yielded a better result. The slow movement, in any case, came out better, with Mozart’s long-breathed lines well shaped. Emily B. deployed discreet portamento to provide an aria-like feeling, quite similarly to how Mozart’s piano concerti act on an operatic scale. The finale, marked allegretto, seemed rather more up-tempo than that, and the piano imbalance reasserted itself, though somewhat counterbalanced by some strong bowing from Emily. There were also some finely wrought passages from Julia, in her rare moments in the sun. The Boston premiere of Queen of Hearts by Canadian composer and NEC faculty member Kati Agócs closed the first half. Neither her written note nor her oral introduction quite explained the title. Commissioned for Claremont and premiered by them in Oregon earlier this year, the work is an extended chaconne, variations on a ground bass, but mashed up with other formal structures, like rondo and verse-and-chorus. There are really two themes, one a bass line as one would expect, the other a more lyrical passage, and they and their variations alternate while gradually fleshing themselves out with melodic elaboration and occasionally “out of focus” harmonization, rising to a complex climax (Ives does something similar in his Violin Sonata No. 3). According to her Wikipedia entry, “Kati Agócs’s music is lyrical, emotionally direct, and dramatic, with clear overall architectures.” That about sums it up for this piece, which draws one in and gratifies with its clear communication. One nice touch, among many others, is that unlike most of the major variation sets one hears, the big lyrical passage does not come at around the three-quarters mark (think of “Nimrod” from Elgar’s Enigma Variations, the Sicilienne in Brahms’s Haydn variations, or the big inverted tune in Rachmaninov’s Rhapsody on a Theme of Paganini), but right at the end, where it serves as a secondary catharsis to the big climax that preceded it (which had its own brief moment of relaxation). The Claremonts matched the intensity and lyricism in the score; plainly, they are making this music their own. Whatever the title really means, the composer and musicians were clearly playing with a full deck. Schumann hailed Mendelssohn’s Trio No. 1 in D Minor, op. 49 as the most important piano trio of the 1830s (it dates from 1839), comparing it to Beethoven’s and Schubert’s from the preceding decades. It’s hard now to emphasize enough how influential it was, with its unstinting ardor attached to impeccable formal mastery, without a single wasted note. Whatever their other merits, none of Schumann’s own trios (nor, to be honest, Mendelssohn’s second trio) could match the immediacy of this one. Brahms’s B major trio could compete with Mendelssohn’s lyricism, but not until his radical revision and excision of ten minutes in 1889 could it deliver its content as economically. As a side note, the Mendelssohn trio is one of the earlier pieces to forgo an exposition repeat, which means that when a composer puts one in, the performer should assume it’s for good reason and not just a formality to be ignored ad libitum. The Claremonts gave a full-throated, impassioned, communicative, singing, and not overwhelmingly subtle reading. As the strings put their shoulders into it, they fully and satisfactorily resolved all questions of balance raised by the Mozart. Julia made up for whatever prominence she was denied in the Mozart, with an ardency and sonorousness evident from the first note. The tempo of the first movement was surprisingly moderate for a movement marked Allegro molto agitato (an approach consistent with their 2004 and 2012 performances available online, so we guess it’s their standard), and we noted with pleasure the close attention and care with which the transition to the recapitulation was carried off. The slow movement, an extended song without words, came with all the tenderness and sentiment for which those piano works are famous, with genuine passion (notably in the B section). The magical violin-cello duets in this movement literally called blood to blood. The brief scherzo flit with appropriate elfinity, as everyone struck brilliant light touches; the intense finale, demonstrating fine dynamic phrase development, never became un-Mendelssohnian,. Overall, we wouldn’t call the performance revelatory, but it solidly satisfied. * Stefan Mendl of the Vienna Piano Trio has lamented the dearth of major piano trios by big-name composers of the 20th century. While there are nearly 1200 such written between 1901 and 1999, inclusive, in the Earsense database, and among them are notable pieces by Ives, Ravel and a few other universally recognized names, his point is not without merit. This, of course, doesn’t end the discussion: as with the extinction of the dinosaurs, the absence of trios by Schoenberg, Stravinsky, Bartók, Hindemith and the like gives performers the opportunity to explore superb repertoire by lesser-known composers from that amazingly stylistically diverse century. I appreciated your note about the historical influence/importance of Mendelssohn’s trio (although I prefer the finale of his other trio to this one’s finale).